Fine motor skills don't develop on their own. It's something that parents need to help their young children develop through practice use. What I find is that those who don't use any writing implements will have under-developed fine motor control. As soon as your child is able to hold a crayon or marker, sit with your child and let him scribble on a piece of paper. Some children will love to see the marks that they make. If so then encourage this daily. If your child does not like to scribble then you have to model it. Get yourself an adult colouring book and sit near your child and start colouring in. Do this daily. 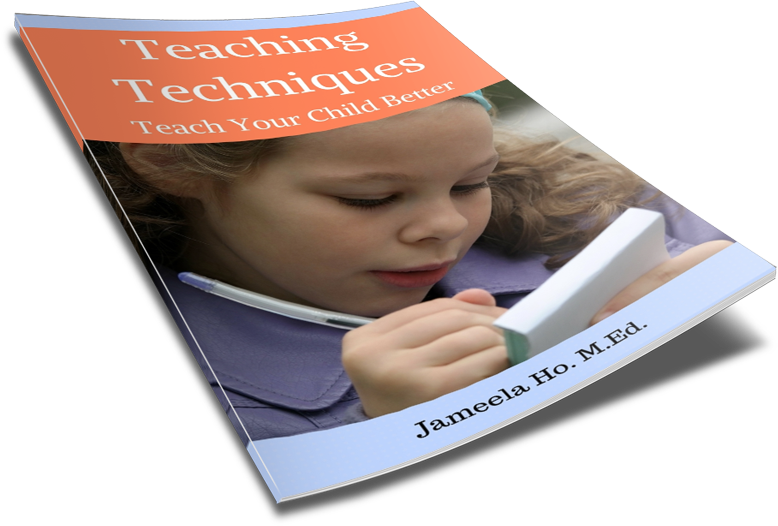 Your child will get curious and will want to grab your markers and start scribbling on your book as well. When this happens, encourage it daily. It makes sense that if your child loves to colour and draw then he will have developed fine motor skills. This is what I consistently find with my students. 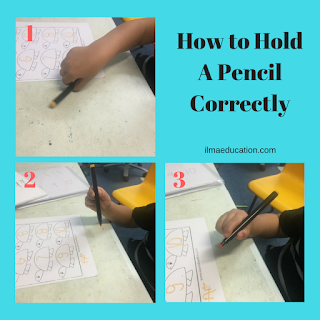 The ones who can sit still and concentrate on their drawings or colourings are the ones who have excellent control of their writing implements and have the correct wrist actions instead of whole hand movements for writing. They're also the ones who have the correct pencil grip. These two components are what makes it easier for children to write with ease, Many children who don't like to colour, draw or write lack these two components. 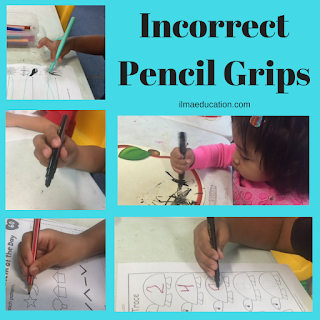 If your child is complaining that he doesn't like to draw or write then check his pencil grip and his arm movements. It's very awkward to write when he's holding the pencil incorrectly and when he's moving his whole arm to write. It becomes a strain and gets very tiring. 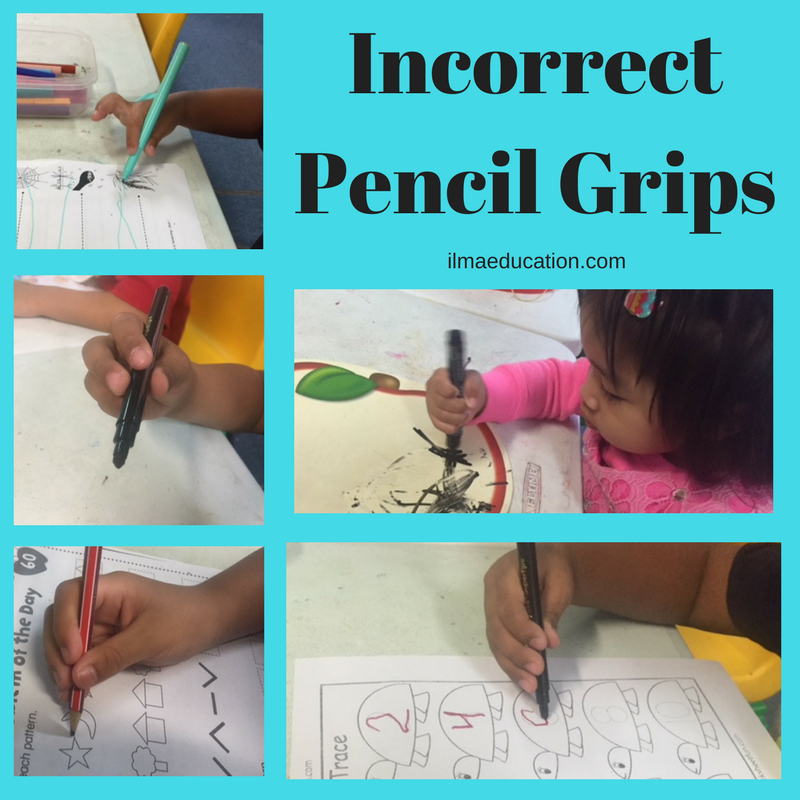 Let's first look at the incorrect pencil grips. There are many variations. These are the most common ones. Most young children when they first start to hold a marker or crayon will do so with a fisted grip (top right photo). 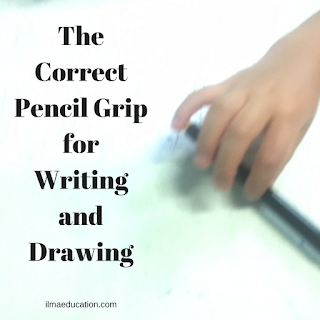 Then you have the one finger and thumb grip, 2-fingers, 3-fingers and even 4-fingers grip along the pencil. 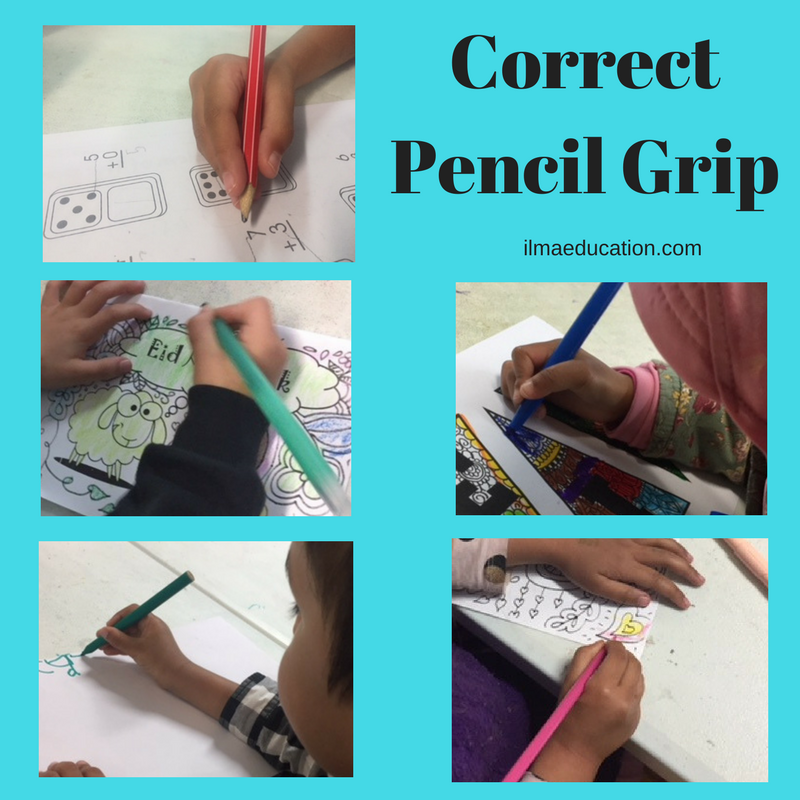 The correct pencil grip uses two fingers and the thumb. It's actually a 2-finger grip with the middle finger behind the pencil for the pencil to rest on. Another problem that children might have is that they may have the correct grip but the length of the pencil is not resting on the junction between the thumb and the index finger. When this happens, their pencil is held vertical to the paper instead of at an angle. 1. Put a pencil on the table and ask your child to pick it up. 2. When your child is holding the pencil up in the air then push the top of the pencil back to rest on the junction between the thumb and index finger.